Step out this Halloween dressed as a billionaire superhero. 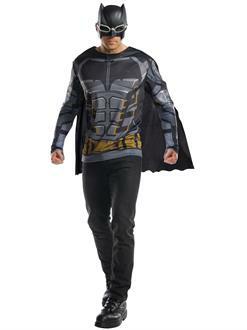 The Justice League Tactical Batman Adult Costume Top comes with a removable black cape and a black mask. Instead of heavy bat-armor, this shirt has printed images inspired by Ben Affleck’s outfit in the Justice League movie. It is much more comfortable to wear than armor so you can put it on any day of the year. In the movie, now that Superman is gone, Bruce Wayne works with Diana Prince/Wonder Woman in creating a league to fight super villains. You can do the same; put this on ather all the superheroes this Halloween.